Last Sunday the Cleveland Cavaliers swept the Boston Celtics and knocked them out of the playoffs in Game 4 of the series. A great first playoff series win for this young Cavaliers squad, but it came with a major repercussion. Kevin Love left the game in the first quarter and it was scary. Not knowing what specifically happened at first glimpse, the live broadcast shows Cavaliers Forward Kevin Love getting tangled up with Celtics Kelly Olynyk while scrambling for the ball. Immediately after, Love sprinted right to the locker room without stopping to talk to anyone. After several replays, it was clear his shoulder was indeed dislocated. A debate on whether it was intentional or not has taken the social media world by storm. The game itself was incredibly physical with technicals and ejections being issued. Cavaliers Center, Kendrick Perkins, set a hard screen on Celtics Forward, Jae Crowder, that sparked some shoving and much trash talking. However, later in the game Crowder and Cavs Guard J.R. Smith got into it while positioning themselves for a rebound. The video shows Crowder shoving Smith pretty hard (definitely foul-worthy). J.R. Smith retaliated though by flailing his arm, with a closed fist, and connected with Jae Crowder… right in his face. Accidental? Maybe. Suspension? Definitely. How long? Nobody knows. So Kevin Love is reportedly out for the rest of the playoffs. J.R. Smith is for sure getting suspended and it could potentially be a few games. After sweeping the Celtics on Sunday, we wait for the Bulls as they look to close out their series with the Bucks. This means the Cleveland Cavaliers are without two of their starters and the two other members on the team, besides LeBron James and Kyrie Irving, that can be consistently relied upon to create their own shot. This takes away a huge element of the Cavs game as they rely heavily on Love and Smith to hit 3’s and space the floor. This may be one of LeBron’s biggest challenges in his career, without a doubt. But I think this focus’ more on Kyrie Irving. Kyrie Irving will be expected to score a lot, as LeBron will be busy defending the variety of players Chicago has such as Jimmy Butler, Nikola Mirotic, Taj Gibson, and Mike Dunleavy. Two other key players for this series that must step up to win are Tristan Thompson and Iman Shumpert. Defensively they need to show up, but offensively Shumpert needs to hit perimeter shots and Thompson needs to continue his offensive rebounding giving Cleveland second chance points. 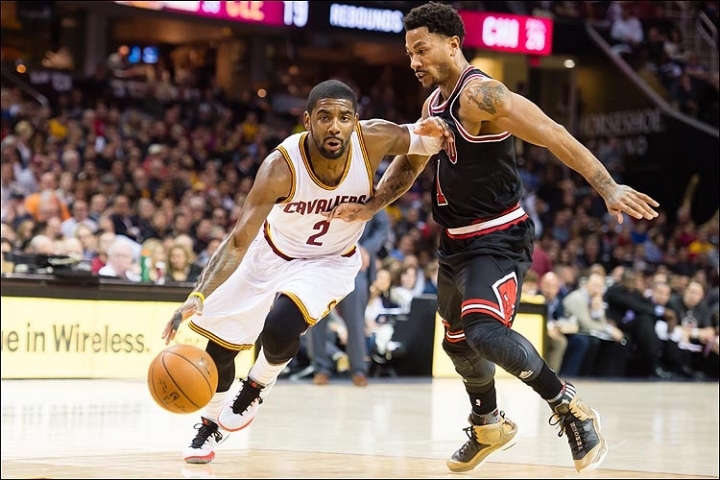 Is Kyrie Irving ready to accept the challenge and put the stamp on the “Superstar” label? This series will indeed determine that as he faces a Bulls team which is finally healthy and has been labeled as the Cavaliers only threat all year in the Eastern Conference, WITH Kevin Love and J.R. Smith. This Round 2 series of the NBA Playoffs between the Cleveland Cavaliers and Chicago Bulls will be the first big test of Kyrie Irving’s young career. Is he ready? We’ll find out this weekend. GO CAVS! This entry was posted in NBA and tagged cleveland cavaliers, Kevin Love, kyrie irving, nba playoffs on May 1, 2015 by Matt Stevenson. Game 4 of the Cavaliers-Celtics series ended in a sweep, but Cavaliers fans lost more than they won. 3 time All-Star Kevin Love dislocated his shoulder after getting tangled up with Celtics Kelly Olynyk and will miss 4-6 months after a successful surgery and, more importantly, the rest of the playoffs. Much debate has been brought up amid the injury if Love, who has a player option with the Cavaliers, can opt-out of his current contract and become a free agent. 3 years of trade rumors when Love was on the Minnesota Timberwolves were consistently held up due to the lack of commitment teams were getting on Love resigning with any team he could be traded to. The price to trade for Kevin Love was simply too high with no guarantee he would stick around for the long haul. The Cavaliers ended up trading the 2014-2015 first overall pick, Andrew Wiggins, in a package with other first rounders and even the 2013-2014 first overall pick, Anthony Bennet, for Love. The Cavaliers executed the trade with a firm belief that Kevin Love would opt-out of his contract upon the end of this season, only to resign with Cleveland for a 5 year maximum contract worth about $120 million dollars. The regular season had its ups and downs, but nobody received more criticism than Love. It was a daily topic on any media outlet whether it was ESPN, Bleacher Report, or even the local Cleveland news stations (and Minnesota’s as well I’m sure). Kevin Love was left out of LeBron James’ Instagram photos, he was called out publicly by LeBron on Twitter claiming he needs to “Fit-In” and him clearly not having the same chemistry as the rest of the team on or off the court. Kevin Love had the roughest season out of ANY player in the NBA this season in regards to the criticism from the media. The reports of him leaving Cleveland because he doesn’t want to retain the lesser role, in which he currently does with the Cavaliers, is a legitimate argument. In the next round if the Cavaliers don’t do well, will Kevin Love be motivated to burn the Cavaliers? As the fans and organization would learn his worth through a devastating playoff exit, he might feel even more offended and motivated to leave Cleveland. 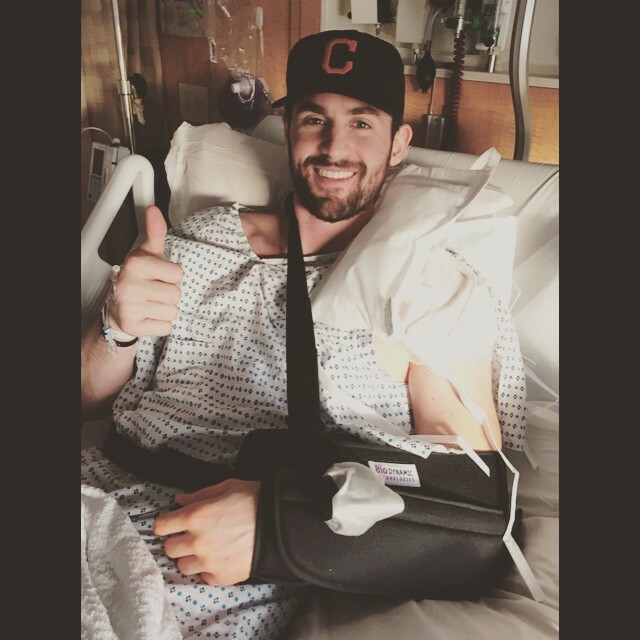 But then the morning after his surgery, Kevin Love posted a simple picture on Instagram, the same app that has been used to exclude him from the Cavaliers. It’s a picture of him giving a thumbs up with an enormous smile on his face. The reason the photo is important is because he is wearing a Cleveland Indians hat. This is not just a hat. It’s a symbol. Kevin Love is thanking the Cleveland fans for the love and support we’ve given him through the awful injury he endured. I believe this is a message to the fans of Cleveland that he is, indeed, staying put in Cleveland for years to come. This entry was posted in NBA and tagged Boston Celtics, cleveland cavaliers, Kevin Love, lebron james, NBA, nba playoffs on April 30, 2015 by Matt Stevenson. Although I say this every year, I AM BEYOND EXCITED FOR THE 2015 NBA PLAYOFFS! The amount of legitimate contenders this year has separated this year’s playoffs from the rest, and significantly so. The Eastern Conference finally has several power houses that can make the first two-rounds somewhat interesting for the first time since Boston’s Big Three left. Then, of course, we have the usual for the Western Conference. This conference is once again more loaded than your Aunt Ruth’s potatoes! A Clippers-Spurs first round match as well as Mavericks-Rockets is awesome. I think three questions are critical to answer for the Eastern Conference: Can LeBron and the Cavaliers continue their dominance? Can Derrick Rose and Jimmy Butler coincide for a deep playoff run? Will the Atlanta Hawks prove to be a real threat to the future of the Eastern Conference? In the first round I think the two-seeded Cavaliers win every single positional battle and will breeze through Boston, although I think Boston will take one game, Cavs in 5. The Atlanta Hawks earned the first seed with an incredible display of teamwork in the regular season, also breaking the franchise record with over 60 wins. The obliterated the Brooklyn Nets in the season series 4-0 and I expect nothing less. Although I’m a huge Joe Johnson fan, and Brook Lopez is playing the best basketball he has since he got paid, Atlanta has everything going for them. Hawks 4-0. Boy, what if we would’ve seen a Pacers-Hawks first-round matchup though? Last year’s 1 vs 8 seed went to 7 games between the two and was great basketball. Raptors against the Wizards is an interesting matchup, as both have more of the “complete team” philosophy. However, the Wizards just haven’t been able to click the way thought they could while the Raptors are playing tough basketball. Kyle Lowry is proving his max contract worth this season when healthy. I thought them nabbing Paul Pierce really could make them threats to any team in the East. Raptors in 6. The last first round matchup in the East is the Bulls vs Bucks. This series is simple for me, Jason Kidd has proved to be a good coach willing to get to players. But without significant depth like the Bulls have (not to mention they have experience as well) the Bucks won’t last. Derrick Rose will get the go to be himself again I think and create a spotlight on the Bulls as reporters will start to get nutty with the idea of a Cavs-Bulls second round matchup. Bulls in 4. So in the Eastern Conference we have a second round matchup between Chicago and Cleveland and Toronto and Atlanta as most expected. I predict the Cavaliers will prevail in this conference as LeBron, Kyrie and K-Love will prove to be too much to handle for the rest of the field. Now the fun part, attempting to dissect the Western Conference. This is much like March Madness as it might be easier to decipher my picks by flipping a coin, but I will indeed choose off my knowledge of the game. I see only one matchup that will be done in 4 and that is the Warriors vs Pelicans. I love love LOVE Anthony Davis, but he’s going up against the most dangerous shooting team in NBA history. But this shooting team can also beat them in every other way because they can stick David Lee, Draymond Green or Andrew Bogut on Davis. Warriors in 4. Grizzlies vs LaMarcus Aldridge’s Blazers can be a great series, however I think it will be done quickly. No Wesley Matthews or Batum for the Blazers therefor relying on who? Alonzo Gee… LaMarcus Aldridge is one of my favorite players in the league but him and Lillard can’t get it done by themselves against an experienced Grizzlies team. Memphis in 5. Now my two favorite matchups in the first round of the NBA Playoffs. The Houston Rockets taking on rival Dallas Mavericks is an exceptionally great first rounder to watch. The Rockets won the season series 3-1, but I have a bad feeling about this. There is one key factor in this series, Rajon Rondo. If Rondo can finally mesh with the Mavs (which he hasn’t so far) they have the best starting line up top to bottom. But of course, what about James Harden? He is my pick for MVP and with Dwight Howard they are a scary team. But they don’t have the guards to defend Dallas’. Scoring won’t be a problem for Harden, as it never is. But I think Dirk Nowitzki has a favorable matchup, as does Rondo. Oh yes, Chandler Parsons who darted Houston for Dallas last summer is going to show his previous franchise why they should have paid him. With two great guards in Monte Ellis and Rondo and the absence of lock down defender Patrick Beverly, I’ll take the Mavs in 7. Perhaps the most exciting first round matchup in NBA history in my opinion, the young and freakishly athletic Clippers host the defending Champion Spurs. Chris Paul said last week, the window is closing for the Clippers to figure it out and he is salivating for that trophy. I think he gives the Spurs problems and will make Tony Parker go to work. Griffin and Jordan pose threats to the Spurs as well and I think they will do a surprisingly good job defending Duncan. But the X Factor is Kawhi Leonard will come through. JJ Reddick and Jamal Crawford aren’t going to stop him, and Matt Barnes is too old to play significant minutes against Leonard. He’s in a contract year, and the Spurs know Duncan and Ginobili may very well retire this season. Pop and the Spurs get it done, in miserable fashion, by a series at 4-2. So in the Western Conference we look forward to a Warriors vs Grizzlies and Spurs vs Mavericks. Talk about great basketball. 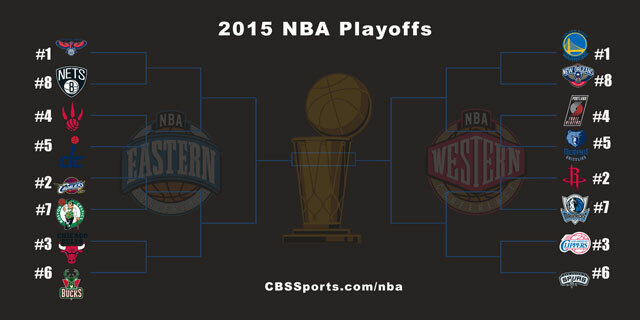 However, in this conference I pick the Warriors to head to the NBA Finals. Although I am a firm believer in the philosophy that just shooting doesn’t win championships, the Warriors are young, fresh and healthy. In which is the Spurs’ weak point because I don’t see the Spurs having the guards to defend the Splash Brothers along with the athletic Livingston off the bench. So Cavs and Warriors in the NBA Finals and as a Cleveland fan I’m going Cavs. The time has come and it’ll be a great year for Cleveland. The NBA playoffs are finally among us, and they are going to generate much excitement across the sports world. The first round has incredible potential regarding match ups and it will spark the greatness to follow. This entry was posted in NBA and tagged atlanta hawks, chicago bulls, cleveland cavaliers, indiana pacers, lebron james, los ángeles clippers, nba playoffs, san antonio spurs on April 18, 2015 by Matt Stevenson.